Tiger Rush is 10-25 paylines and 5 reels slot machine developed by ThunderKick gaming limited. Coin sizes for the game ranges from 10p per spin to up to £100 per spin. The game offers a jackpot of 425 times on your total bet and it means you would have a chance to win a maximum of £42500 from the game. 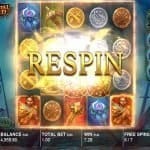 The game has a bonus round and free spin bonus feature where you could win up to 20 free spins and multipliers. You can play tiger Rush online slot at Casumo Casino or at any Thunderkick online casino site at any of your devices including mobile phones, tablets or desktop. 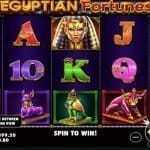 This slot is inspired and themed on a big cat i.e. on tiger. 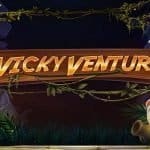 The game comes in with an expanding tiger wilds and free spins. The bonus free spins is playable at 25 paylines reel set. Symbols of the game are stones wrapped in leaves, different coloured flowers and a bird. The bird is the highest paying symbol of this game which would give you 15 times on your total bet if you land 5 of these symbols across a payline. The tiger is the wild symbol of this slot game and it can replace all other symbol on our screen except the scatter but it only appears on middle 3 reels i.e. on reel 2, 3 and 4 and when it appears, it will expand to the whole reel and give you a great chance of win big. Or more wild symbols on your reels will add free spins to your account. 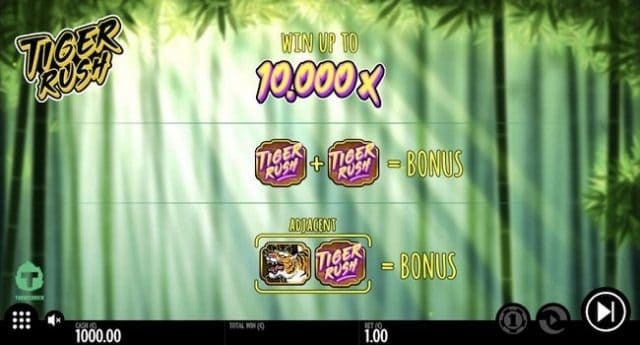 The game has a scatter symbol in the form of The Tiger Rush which appears only on reels 1 and 5 and if you land 2 scatters then you will trigger Bonus game feature and you will be rewarded free spins.